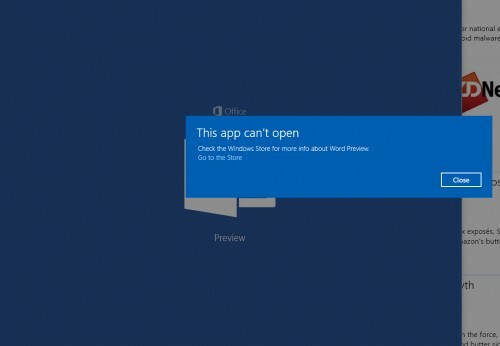 If you’re using Windows 10 and installed the touch-centric Office Preview prior to 2/23/2015, then you’ll likely run into an issue where Word Preview, Excel Preview, and PowerPoint Preview won’t start. The error will look like the one above, and uninstalling/reinstalling the apps won’t fix anything. I don’t believe this is tied to the Windows 10 Build, but I can’t test it–all of my Windows 10 systems are running Build 10049. There was an issue with the Store Licensing Service which meant that the Preview Apps were given a license that timed out far too quickly. This was fixed on 2/23. Unfortunately, this exposed another issue whereby the Store would fail to acquire a new license if one already existed – regardless of whether the license had expired. Removing an app and installing again doesn’t clear the cache, so even if you do this the app still fails to acquire a new license on startup. So basically if you installed the app prior to 2/23 then you would hit this issue and removing and reinstalling the app won’t fix the problem. We’re currently working on getting a fix into a Windows update, and I will shortly be posting how you can manually work around this in the meantime. The better news is that for those willing to put in some effort, there’s a workaround listed a bit lower in the same thread. It involves creating a text file and running a batch program; if you’re comfortable with that process, have at it. If you’re not comfortable with the workaround process, then you’ll just have to wait a bit. As with life on the bleeding edge in general, patience will be awarded.